Like I mentioned above, it all began in July-August. In fact, in August, I made the following Google+ public post (02 Aug). Me: Ah, very nice. I’ve been accepted as the 40th member and 6th bounty hunter of “The Sith Assassin Elite” guild for the upcoming “Star Wars: The Old Republic” MMO. Then one day, I replied to a Google+ public post (01 Sep) by a fellow artist. Me: Very nice. Hey, question for you. As an intermittent Photoshop artist, I’ve only dealt with 2D. 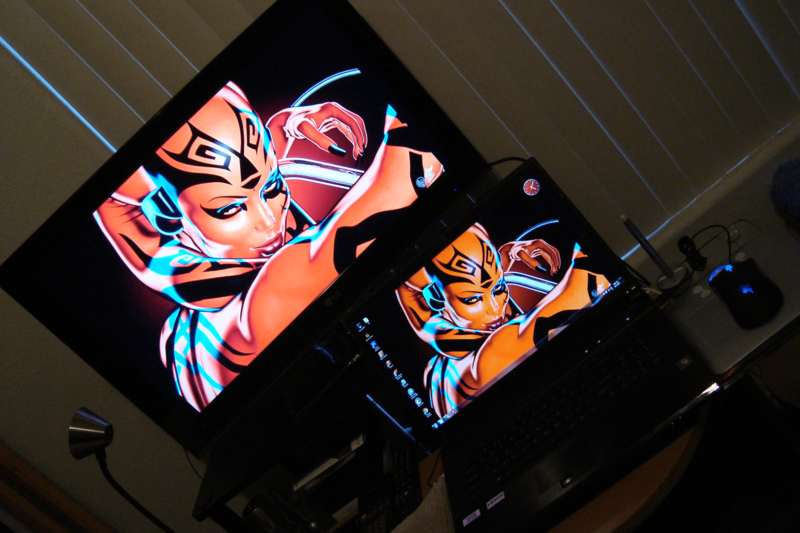 But with all the 3D SWTOR art I’ve been seeing, I’m thinking of making the hyperspace jump from 2D to 3D art myself. Assuming a new gaming PC soon, what 3D rendering tool would you recommend? Poser? (Version 9 is coming soon.) DAZ? Patrick Lambert: Both work fine, depends on your preference really. Prepare for a bit of a learning curve. Here’s my Google+ public post (08 Sep). Here’s my Google+ public post (11 Sep). Here’s my Google+ public post (17 Sep). Yup, looking back, it was a good idea to get familiar with some 3D rendering software. 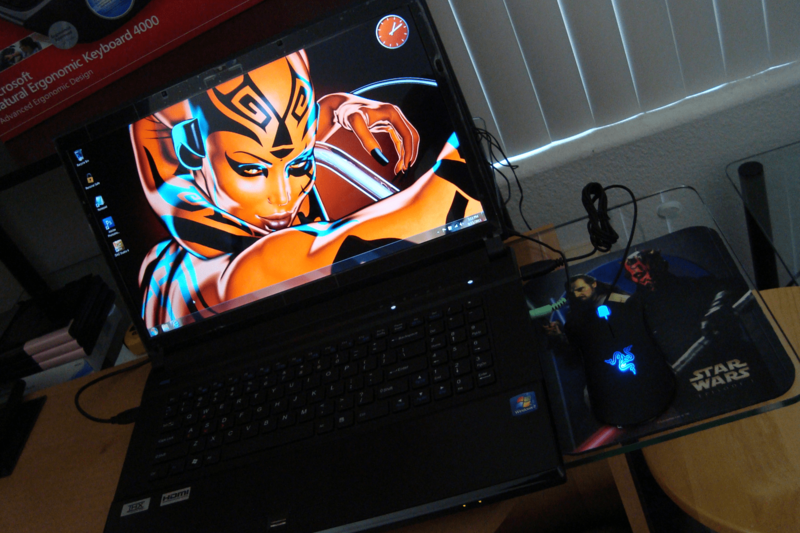 The next step was getting better hardware, not just for more SWTOR-MMO power, but for more 3D-rendering power as well. Here’s what I wrote in my Google+ limited post (23 Sep). The following week, even more cool hardware, hehe. Here’s what I wrote in my Google+ limited post (01 Oct). Over the past week, I got a raise and completed my 200-day J200X workout. What better way to celebrate than to find a 32-inch buddy for my 17-inch Darth Talon?… For the Empire! Finally, with this cool new hardware, I was able to take another larger step by installing new Poser software and achieving more powerful 3D renders! SWTOR-styled 3D renders, of course, hehe. Here’s my Google+ public post (03 Oct). Amazing. If you remember, I tried the new DAZ Studio 4 (free) for several weeks. Then last week, I installed the powerful new Poser 9 for the first time. Lo and behold, after 7 days of Poser 9 practice, here’s my first 3D render with multiple characters! “Zhaanin’s Revenge”. Photoshop post-work for the lightsaber, smoke effects, and text. Here’s my Google+ public post (07 Oct). Here’s my Google+ public post (23 Oct). Ahh, back from a hectic week at a software user conference in Vegas… So it’s time for another SWTOR 3D render! But first, an observation: From what I’ve seen on DeviantArt, lightsabers are pretty tricky to execute, particularly the blade. Artists (even faves like Darth Hell and Aphrodite-NS) occasionally misalign the blade with the hilt, or the blade is too short, or sometimes the blade effects aren’t quite right. Personally, I’ve based my blade lighting on Darth Hell’s designs and of course, the SWTOR cinematic trailers. Now, although lightsabers or duels are non uncommon in 3D renders, what I rarely see (even from Darth Hell and Aphrodite-NS) are duels where sabers are locked against each other, blade on blade. My guess for this rarity is the multiplied trickiness in achieving an aesthetically pleasing arrangement, proper blade alignment, and excellent blade lighting, all at once. Definitely a challenge! So of course, my newest 3D render accepts that challenge, tosses in a third blade, and adds some swirling smoke in between, haha. Well, here they are: Yukiko and Akiko Silverstream, Jedi sisters in training! My Sith Zhaanin better watch out! Hope you enjoy. Here’s my Google+ public post (26 Oct). Hmmm, maybe I should revise my assessment: Only weeks to adjust, and months to master? Otherwise, that’s all, folks! I think we’ve adequately felt the Force, hehe. But hey, if you’re interested in some of my other “Star Wars” broadcasts, just click the “Star Wars” link at the top of this page. Otherwise, take a peek at my “Possibly Random Links” below. Till next time. Peace. Out. 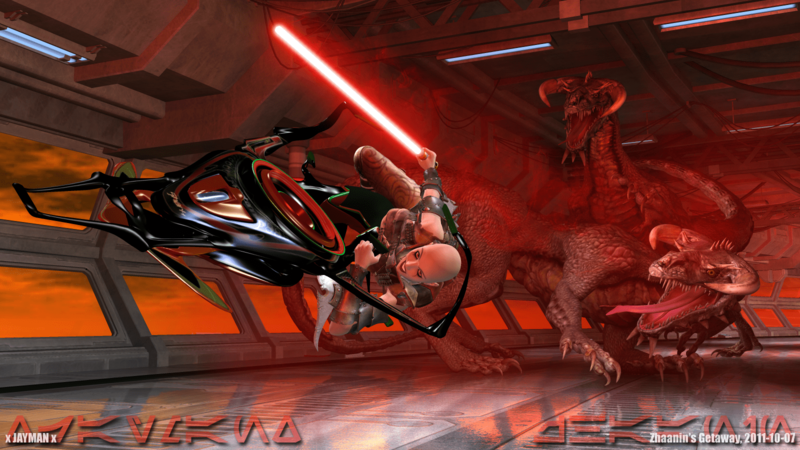 This entry was posted in 3D Renders, DAZ Studio, DeviantArt, Google+, Old Republic, Poser, Punk Trooper, Star Wars. Bookmark the permalink. As usual, the images are taking forever to load on my com, so I’ll just say this based on what I’ve seen on G+: Fantastic work! …can’t wait to see you do a Hutt, hehe. For some reason though, I always thought you were on the more… techie side of the road, instead of the creative side. @A20: Ah, no worries. In fact, I’m no stranger to having one foot in the technical and the other foot in the creative. Just haven’t been this visually creative in a while, not since my anime art days (remember Mimi’s Momo?). Regarding GIMP, it should still be free. I remember trying it once, years ago, but I think the interface is only challenging if you’re already used to the Photoshop interface. Might as well try it out, right? Ahh, right. Completely forgot about that… it’s been some time. @A20: Nice to hear! Well, nice to hear about installing and enjoying GIMP, not the mutilation part, haha. Wow! These are really awesome graphics dude! Great job!